Red 28! Red 28! I like candy! Hut! Hut! This Sunday is the 44th Super Bowl in American history. Despite its youth, it will be the largest food consumption event of the year, trailing only Thanksgiving. It isn’t a national holiday (though many would like it to be), but that doesn’t stop over 130 million Americans from treating it like one. It's estimated that Americans will spend over $55 million dollars on food for the Super Bowl. What will all that money buy? Mostly snack foods -- more than 30 million pounds. Pretzels and popcorn get the most play, though chips and guacamole have gained yardage in the last few years. According the California Avocado Commission, over 50 million pounds of avocados will be sold in the days leading up to the Super Bowl, most of which will turned into guacamole and scooped up with 15,000 tons of chips. Super Bowl foods have to be casual, portable, and, most important, fun. Fans don't want to think about their food; they just want to be able to hold it in their hands and not have it explode all over themselves when they jump up to high-five each other over a touchdown. For your Super Bowl party, think like a guy. Serve sticky barbecued spare ribs, cheesy pizza, spicy chicken wings, overstuffed sandwiches, and gut-busting gumbo. For dishes requiring utensils, like chili or jumbalaya, I suggest serving them at half-time. This will both ensure the safety of your guests and distract them from the painful Super Bowl half-time show. Serve beer. Lots of beer. Don't use fussy dinnerware and cutlery; sturdy paper plates, double-ply paper napkins, and huge plastic cups perfect for refills are what’s needed. Keep desserts simple. Brownies, cookies, and cookie bars are the way to go. When the party's over, you might consider sending your guests home with a bottle of Tums and a doctor's note. Antacid sales spike 20% on "Super Monday," the day after the Super Bowl, when 6% of working Americans call in sick. Whether you're football-savvy enough to challenge John Madden on the NFL's rulebook, or you think a Hail Mary is a religious term, chances are you'll be at a Super Bowl party this Sunday chowing down some seriously good football grub. So check back all week for more easy and delicious Super Bowl recipes that are sure to score big. 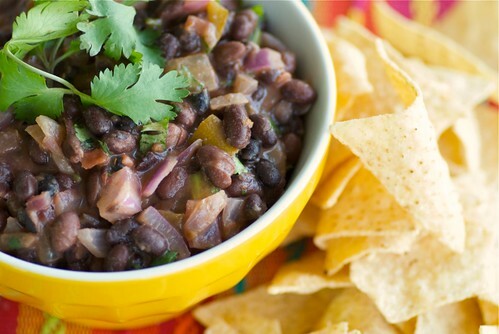 This spicy black bean dip couldn't be easier to make. With red onions, garlic, jalapeno, and lime, it's got both heat and tang. The sour cream adds just a touch of silkiness to an otherwise satisfying chunky dip. This vegetarian dip can be made vegan by using vegan sour cream or mayo. 1. In a small pan over medium heat, warm olive oil. Saute red onion and garlic until lightly browned. Transfer to a blender or food processor and add remaining ingredients. Pulse until chunky. Transfer to a bowl. Serve with tortilla chips. Great dip for the big game. I can't wait until Sunday! We are huge football/sports fans! A tasty dip! Perfect for such an event! Nice idea for the Super bowl. What a nicely written post. I really like the part about Hail Mary!! Looks great. What's chips without the wonderful dip. One of my favorite kinds of dips! Looks simple and delicious! The snacks are the best part about the SuperBowl! The more, the better. 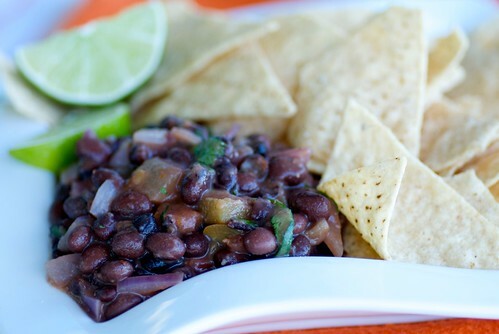 Black beans are one of my most favorite things ever to keep in the pantry. The Teen will eat them without question, and we love a simple beans and rice meal, chopping up poblanos and jalapenos and a lot of onion to give those beans a real kick. A bowl of good black beans never lasts long in my kitchen. Mmmm......yum! I am a huge fan of black beans, and this sounds perfect! Mmmmmm! A Super Bowl party just cannot possibly have too many dips. This looks yummy and unlike so many other dips, actually includes honest food ingredients. Thanks! With Superbowl coming up, I've been going nuts food shopping and looking for good but simple ideas to feed the crowd. This sounds good!